Re: Show us your knives! When did you pick up the Ashi 180 petty? I've been dying to see how one fits me in-hand.... I might need to stop by your place for a beer soon. Ben!! I bought it for my wife, but she just loves the Mizuno and this one gets neglected. If you like light, you'll love this little devil. Come over for a beer whenever, you have my number! Seeing everyone post these epic collections is making me want to try some new knives! We are enablers, for sure! Come over and borrow a knife or three. Very nice collection Dan, some impressive knives in there! I'm with you on Mazaki. I own three (I've also sold three that didn't quite make the cut). They're all very different knives, with very different profiles and very different grinds, and they are all very top-shelf. One if them (the latest profile from JNS) is by far my most used knife. So I thought I would post my knife bag collection. These are my everyday work knives and I'm finally happy where I'm at with them. A few beauties and a few beasts. My growing addiction, uh... I mean collection. Yeah...collection. 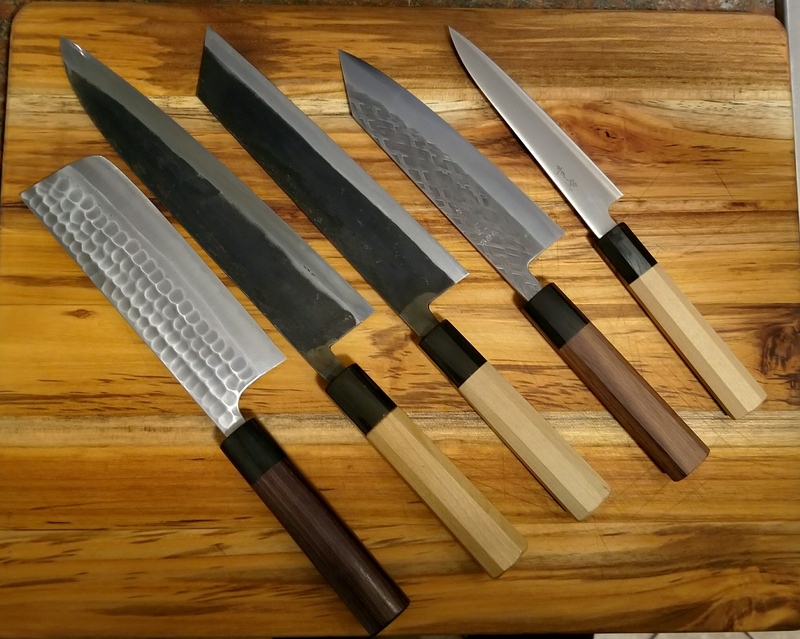 Anryu B2 165mm Nakiri, Moritaka AS 240mm Gyuto, Moritaka AS 210mm Kiritsuke, Kohetsu SLD 170mm Bunka, Konosuke Swedish 140mm Petty. Thanks. I think a suji would fill this out nicely. Excellent variety in style and steels! About another dozen more knives and you can join our J-knives Anonymous Club. My sharpening station and my Shibata Kotetsu 210mm SG2 Gyuto. That western handle, bottom row, looks sharp. Who makes it? Great looking collection! Love the variety in both handles and blades. Can you comment on why Nitro-V is your favourite? I haven't heard a ton about it. Comparisons to other steels? Cheers! It just a another version of AEB-L , feel good on the stone for stainless steel(not as good as carbon), I like it at 63 HRC and able to sharpen at a very low angle. Also it's a good steel for the price comparing to CTS-XHP and CPM-20CV. I was one of his early testing subject lol. Great workmanship for his age. I was thinking the same thing! Going to have to support a young talent now.